Want a sparkling look of freshness? Lavera Natural Illuminating Eye Cream is the perfect cosmetic for you! Thanks to light-reflecting pigments and pearl extract, it brings light to eyes for naturally sparkling eyes. Enriched with hyaluronic acid, anti-aging active plumping properties, this natural care smooths the skin and fills wrinkles. Caffeine provides the necessary hydration and promotes blood circulation. Its melting texture subtly covers the shadow areas such as dark circles and lighten the eye area. 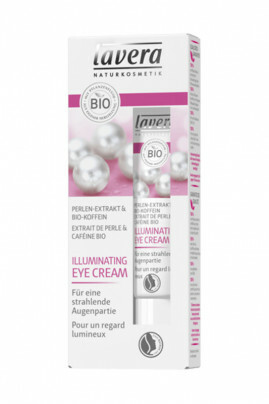 Lavera Natural Illuminating Eye Cream naturally illuminates the eyes! Begin by applying it from the inner corner of the eye and then over the entire area. Make penetrate the treatment by gently tapping with the fingertips. Renew the application if necessary. An illuminating cream with natural composition!